Flat Panel Pros is your full-service home theater solution. From TV mounting to surround sound set up and whole-house audio, we custom design your audio visual system based on your needs. With wireless options and in-floor and in-ceiling designs, we can create a seamless, customized home theater installation that sounds amazing while remaining invisible. Call today and let us know what you have in mind for your home theater in Portland. We use the most trusted brand names offered at discounted rates that you won’t find in stores. Our theater systems are customized to your specific needs, so you never wind up buying more or less than you need for your designated space and desired output. We utilize the latest smart TV technology and integration of devices and programming like Amazon Prime Videos, Netflix, and Hulu. You will feel the impact of your custom theater experience. Our experienced technicians start by assessing the location of your home theater and listening to what you want to accomplish. We take into account everything from the current placement of outlets to the natural acoustics of the space. 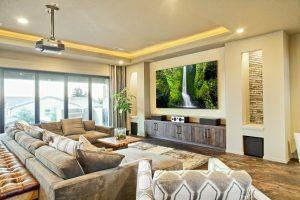 From there, we draw up a home theater design and discuss that plan with you. We make adjustments according to your input. You can count on us for a well-planned finished system that suits your every need. Call today and tell us about the home theater you have in mind.